For the first year that the original iPhone was around, Apple did not let other companies make applications for the iPhone -- something hard to imagine now that there are approximately 10,000 apps available in iTunes. (Click here for icons of all of them on a single page put together by the site 148apps.com, and click here for a fun mosaic image of an iPhone made up of apps icons created by the folks at TapTapTap.com. By the way, the name "148 apps" refers to the fact that the iPhone can hold 9 pages of apps, 16 icons a page, plus 4 more at the bottom, which is a total of 148 apps.) But during that first year of the iPhone, where there were no apps, Apple encouraged others to instead make web pages specially formatted for the iPhone to add additional functionality to the iPhone. Even today, some of the most-used icons on my iPhone's Home Screen are not apps but instead are links to web pages specially formatted for the iPhone. (When you are on a web page in Safari, tape the plus icon at the bottom to create a bookmark, then click the button that says "Add to Home Screen," and then there will be an icon on your Home Screen that looks just like an application icon but that links to the web page.) One such website with a great iPhone interface is Alltop. You can access Alltop from your computer at http://alltop.com. It is a great website started by three people, one of whom is Guy Kawasaki, one of the original Apple employees who became famous for being the chief evangelist for the company in the 1980s and then again in the 1990s. When you go to Alltop, you select one of hundreds of topics such as Agriculture, Extreme Sports, Kids, Macintosh, Photography, Wine or Zoology. Alltop then shows you what it considers to be the top blogs devoted to the subject and the last few posts from each of those blogs, all on a single, easy to skim page. 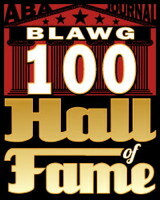 One of the largest pages is the Alltop page for Law which lists over 150 great law blogs. Just to pick one example: SCOTUSblog is the best source for U.S. Supreme Court news, with everything that you need to know on cases being considered, live blogging the second that new opinions are released, etc. If you are following a case before the Supreme Court, you need to read SCOTUSblog. 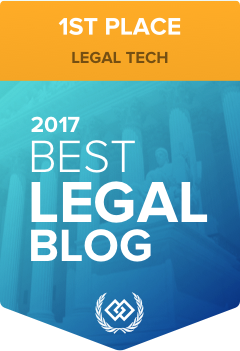 By just skimming the Law page, you get a survey of the top legal stories being discussed by all of the top law blogs, including SCOTUSblog, and you can click on links to jump to specific blogs and read more. Alltop looks great on a web browser on your computer, and the mobile version of Alltop looks fantastic on an iPhone screen. I encourage you to keep on your iPhone a bookmark to either the main Alltop mobile page, http://alltop.com/m/, or a link to the specific Alltop page that is of particular interest to you. The Law one, for example, is http://law.alltop.com/m/. 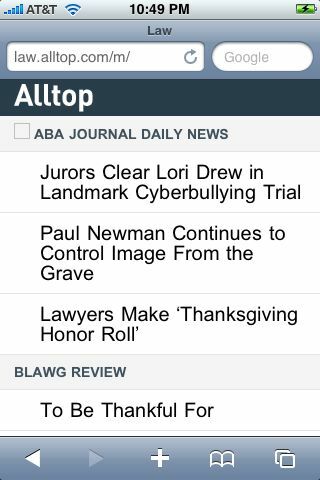 The next time you have a few minutes of downtime, such as standing in line at the grocery, you can look at Alltop on your iPhone and instantly get up-to-date on law or whatever other topic strikes your fancy. Those of you who currently use an RSS reader might be wondering, isn't Alltop the same thing? In a way it is because Alltop relies on RSS feeds. But the great thing about Alltop is that they have already done the work and found the best sites for you. If you wake up one morning and find yourself interested in reading about bacon, the Alltop Bacon page has already picked out the top 17 sources of Bacon news. That's right, 17 sites on bacon. I kid you not. 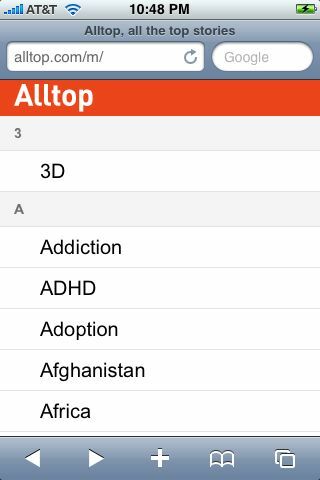 I had long ago planned to write about Alltop on iPhone J.D. because I use it all the time to scan the top blogs that cover Law, Macintosh and the iPhone. But just a few days ago I was honored to learn that Alltop has added iPhone J.D. to its iPhone page. As the most recent addition, it is all the way at the bottom of the Alltop iPhone page, but we all have to start somewhere! So add a bookmark to Alltop to your iPhone. Alltop is efficient, effective, and best of all, free. Free as in Beer.